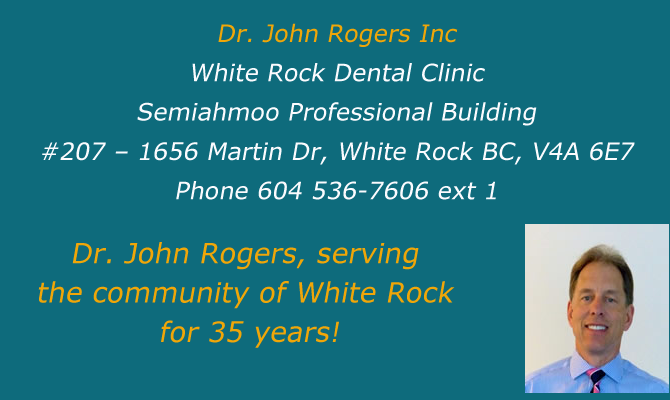 White Rock Dental Clinic was established in the 1970’s to serve the people of White Rock and South Surrey. For over 35 years the doctors and staff have been helping our customers preserve and maintain their teeth over their lifetime. We help many people from 3 to 93 make the most of their smile. With modern advances in dental treatment and techniques, now more than ever before, it is possible to have a winning smile, with robust teeth, permitting you to enjoy eating well into old age. Regular and quality care for your mouth, teeth and gums can help you achieve a more fit, happier life. An engaging grin is wonderful for self confidence and makes an important first impression. In the gentle hands of Dr John Rogers and his team, you can be assured that your dental health will be well looked after, and that small issues will be addressed before they are allowed to escalate. We provide a full range of general and cosmetic dentistry services. Please do not hesitate to get in touch with us to arrange your first consultation. We see emergencies the same day during business hours. Please call us at ( 604 ) 536-7606 ext 1. Emergencies of current patients can call Dr John Rogers directly at ( 604 ) 788-7007.